Trekking to see the fabled mountain gorillas is something everyone should get to experience at least once in their lifetime. Gorilla permits are certainly not cheap ($500) and the hour you get to spend with these gentle giants whizzes by in a flash, but the experience will linger for a lifetime. When a family of gorillas permits you to enter their safety zone and their guardian silverback allows your group of eight privileged tourists to sit quietly in their presence, it’s the ultimate honour. Even though I’ve trekked to see the gorillas on numerous occasions, this meaningful encounter with other sentient beings is an experience that makes the hairs on the back of my neck stand up every time. Aside from the chance to chill with our distant relatives, Bwindi also offers a whole host of picturesque forest walks and half-day birding safaris. I particularly like taking a day or two out from the gorillas and tramping through the rainforest with a park guide to some distant river, spotting colourful birds along the way and always hoping that a wild gorilla might just cross the path ahead. (Remember: Bwindi is a typical rainforest and there is no real dry season, so come prepared). Uganda is one of only three countries in the world (the others being Rwanda and the DRC) where the iconic mountain gorilla can be reliably tracked on foot, an experience I’d have no hesitation as commending as the most thrilling wildlife encounter Africa has to offer. And of the 13 habituated gorilla groups in Uganda, all but one is resident in Bwindi, spread between four trailheads: Buhoma, Ruhija, Nkuringo and Rushaga. Yet, while the opportunity to stare into the liquid brown eyes of a giant silverback is what brings most tourists to Bwindi, it would be massively reductive to treat this magnificent forest, which sprawls over steep hills nudging the Congolese border, as merely a ‘gorilla reserve’. Bwindi is an excellent place to see localized forest mammals – indeed it is the only place where I’ve seem the bizarre yellow-backed duiker and the one place in Uganda where you regularly encounter the handsome L’Hoests’s monkey. The birdlife is also stunning, with a checklist of 350 species that includes a full 23 Albertine Rift endemics. Indeed, the forest trails around Buhoma, the most established of the park's four trailheads, and the best equipped when it comes to upmarket lodges, ranks among my favourite birding spots anywhere, reliably offering sightings of rarities such as bar-tailed trogon, black bee-eater and a profusion of forest greenbuls, finches and warblers. Elsewhere, for adventurous and fit walkers, the remote Mubwindi Swamp – for which the park is named – is home to herds of forest elephant and the beautiful African green broadbill, an Albertine Rift endemic only otherwise recorded in an inaccessible part of the DRC. Tracking mountain gorillas has been one of my ultimate wildlife experiences ever. I love all primates, but there is something about looking these gentle giants in the eyes, that blows your mind. Unlike habituated chimpanzees that seem oblivious to your presence, gorillas seem to really look at you. The park itself is all a rainforest should be: mystical, dense and very wet. The day we tracked the gorillas, it rained all day. This took a little bit from the experience, but what else can you expect in a rainforest? The birding is amazing, but like in every forest, it is very hard. Good birding guides are available on the spot and they make all the difference. Bwindi is special. Sure, there are elephants here, so they say….and even bushbuck and duiker, but seriously, who cares…in Bwindi it’s all about the gorillas! I never had the kind of gorilla experience I had read about; ie, a cute baby furball coming to play with my leg while I kept the required 7 metres away from the family group. That said it was a magical and surreal experience deep in thick forest, observing a family group going about their business of playing, snacking, grooming and lolling around in the sun. It took about 4 hours to find the family of gorillas that our group were tracking (it can take a lot less depending on their movements in the previous 24 hours). That’s the adventurous part, heading (mostly) uphill on slippery ground through thick forest with the aid of walking sticks and local helpers who assist in pushing/pulling/dragging you up and through the roughest parts of the trek. I can’t imagine how difficult it would be in the Wet season! The reward makes it all worthwhile when the gorillas are finally located. These big, beautiful, human-like monoliths staring at you amongst lush greenery is spellbinding. They were surprisingly tolerant of guides cutting foliage around them so we could all get a better look. Altogether, we had an unforgettable hour with the gorillas – and it rates as one of the most special wildlife experiences I have had. This park is called impenetrable for good reason. Its dense rainforests make gorilla tracking hard work but the hour spent with these wonderful creatures is totally worth all the effort and expense and one you’ll never forget. Be prepared for some steep, muddy climbs on indiscernible tracks that frequently demand machetes to hack a way through the vines, thorns and shrubs. Bwindi currently has 12 groups fully habituated for tracking, with only eight visitors allowed to visit a group on any one day. 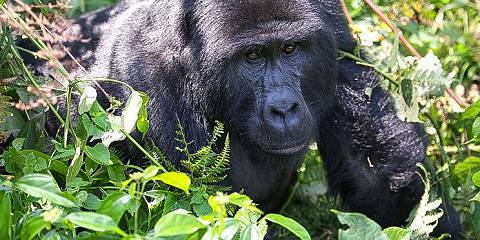 A very different encounter – the Gorilla Habituation Experience – has recently started involving the Bikingi group that isn’t fully habituated: they’re used to their trackers but not to seeing different people every day. It’s an exciting alternative – instead of just one hour, we had four hours starting from when we reached their previous night’s nests. We actually tracked the gorillas with their trackers, unlike regular tracking where you’re simply taken to where the group have already been found. 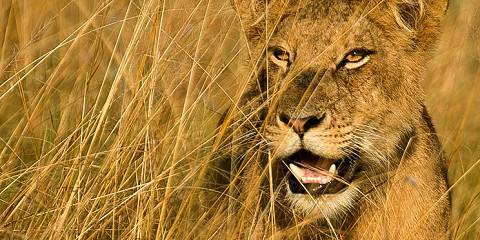 It’s physically demanding – semi-habituated groups aren’t as calm, or docile, as other groups can be when they’re fully habituated – and they move fast. The objective is to move with them, to stay in their sight so that they gradually get used to having people around and you get to that magical seven metre distance from them. It’s an immersive experience, at times edgy, and often exhausting – but the rewards far exceed the efforts. It’s expensive too at US$1500, but that is the same price that you’d pay in Rwanda for regular tracking. I’d also recommend a day visiting the Batwa Experience, a “living museum” in the forest for a fascinating insight into the culture of the Batwa Pygmy tribe who lived alongside the gorillas for 4000 years until they were evicted when Bwindi was gazetted as a National Park. I was travelling on an assignment with MAPA project, spending a month mapping Uganda’s national parks, when I arrived in Bwindi. For our purposes it certainly was virtually impenetrable since there are very few tracks that can be driven in the vicinity of the park and almost no way to access the interior of the park without signing up for a guided trek with rangers. We explored some of the less known jungle trails though and the sense of excitement in this park is certainly boosted by the feeling that you might at any moment (even on the outskirts of the busy camp) run into a family of gorillas! 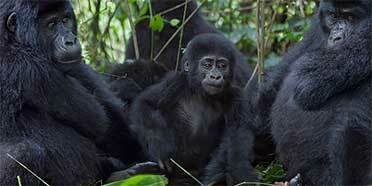 Bwindi is home to half the world’s population of mountain gorillas. Unless you strike it incredibly lucky, viewing opportunities for actually watching the gorillas are (justifiably) strictly regimented and (also justifiably) very expensive. 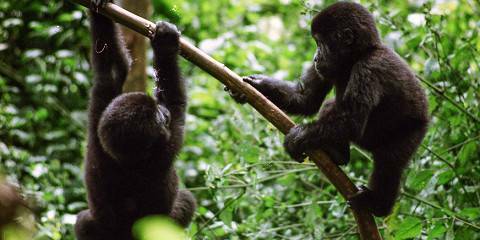 Visit gorillas in one of Africa’s most ancient jungles. I loved my walk through this lush jungle and there are several guided trips available for those not seeking gorillas. And because of the tight limits on the number of people who can track gorillas, the lodging areas (there’s no lodging inside the park itself) are never too busy, so just hanging out and soaking up the mountain views can be enjoyable too.